Texas Red Oak - Quercus texana, (also called the Nutall Oak) is a medium to large tree that grows to reach heights of 115 feet tall and 3 feet in diameter. 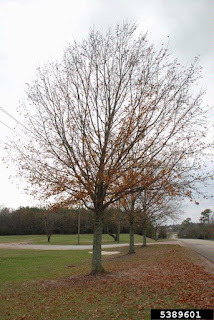 The Texas Red Oak has a swollen base and spreading, horizontal, slightly drooping branches. Texas Red Oak is commercially important in the floodplain areas of the Mississippi River, where it is harvested as Red Oak. Wildlife rely on the acorns of this species as a reliable source of food. 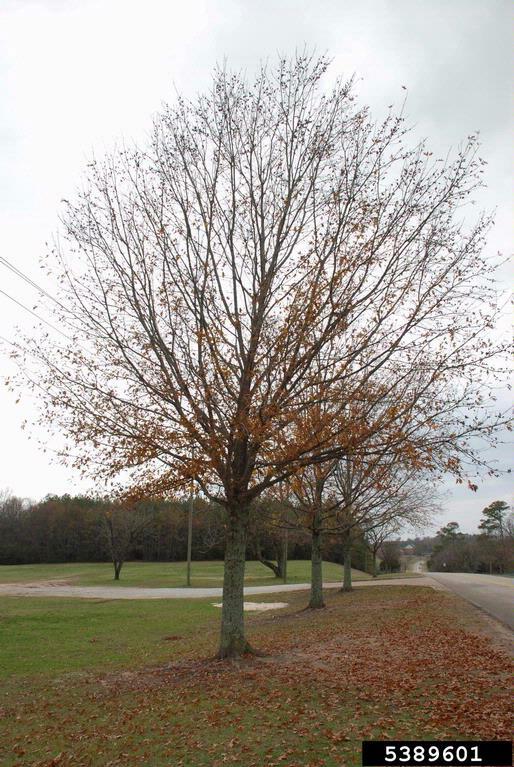 Due to it's strength, ability to grow well in poor soil and nice appearance it is becoming a popular shade tree. It is native to floodplains, bottom land woods areas, and wet clay soils from 0-200 m. It is restricted in range mainly around the Mississippi River drainage basin from Alabama west through Eastern Texas, north to Southeastern Missouri and Southern Illinois. The bark of young trees is light brown in color, thin and tight with slightly raised squiggly shaped plates that cup up at the edges. When sunlight reflects on this trees bark it reflects narrow silver streaks. The branches are noticeably long, straight and slender with the lowest ones slightly drooping down towards the ground. The leaves are alternate, simple, ovate, elliptic or obovate, with a wide angled or flattened base, with 6-11 lobes, all lobes are sharp pointed and bristle tipped. 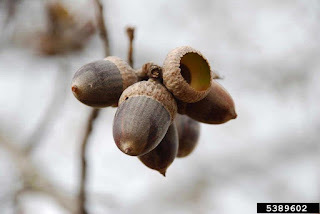 The fruit is in the form of an acorn with a cup that is 10-16 mm deep, the outer surface is hairless or finely hairy. The cup of the acorn encloses 1/3-1/2 of the nut, the nut itself is broadly egg shaped or ellipsoid.